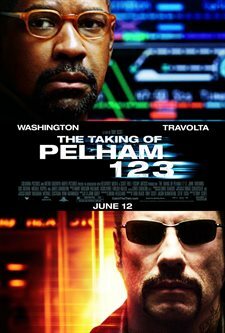 In "The Taking of Pelham 1 2 3," Denzel Washington stars as New York City subway dispatcher Walter Garber, whose ordinary day is thrown into chaos by an audacious crime: the hijacking of a subway train. John Travolta stars as Ryder, the criminal mastermind who, as leader of a highly-armed gang of four, threatens to execute the train's passengers unless a large ransom is paid within one hour. As the tension mounts beneath his feet, Garber employs his vast knowledge of the subway system in a battle to outwit Ryder and save the hostages. But there's one riddle Garber can't solve: even if the thieves get the money, how can they possibly escape? Download The Taking of Pelham 123 in Digital HD from the iTunes store. The Taking of Pelham 123 images are © Sony Pictures. All Rights Reserved. The Taking of Pelham 123 was a 1973 thriller about a group of thugs who take over a subway train and threaten to kill one hostage a minute unless they are paid 1 million dollars. It was remade in 1998, but then the ransom was five million dollars. Today the ransom is 10 million dollars -- hey, inflation --and perhaps the target money is even far greater than that. As a story, Pelham has a decent track record; the first one won several awards, and the most recent, gets the Scott treatment with Tony giving it the quick-cut modern-violent treatment. It also gets some heavy-hitting star power with John Travolta (the go-to guy for charismatic villains) playing Ryder, the chief kidnapper, and Denzel Washington (the go-to guy for characters with a lot of heart), playing the transit-dispatcher who gets caught up in the drama. The production is slick, and the framework for the movie is well tested. The framework for hostage thrillers is well established; we are introduced to a seemingly straightforward, if frightening beginning, where the hostages are taken. We get to sort-of-meet-some-of-them. In Pelham we get the mother and little kid...and the skateboard guy with the laptop that loses its signal as he enters the tunnel. We meet the criminals, and may be invited to sympathize with them, getting Stockholm syndrome along with the hostages. We meet the negotiator and watch the interplay between them. We see the balance of power shift back and forth as one side maneuvers against another. We try to guess the hostage-taker's end-game. We want to see the hostages live. This dramatic structure is played out deftly by Scott who knows that pointing the camera at Travolta and watching him be intense will pay dividends without him virtually having to do anything else. He knows that audiences will like Denzel and believe he loves his wife and daughter even if his daughter is never seen and his wife appears for scant instances of screen time. If anything, the problem is with these two actors, Scott doesn't have to do much else -- and more or less stops there. The surprise is James Gandolfini as the mayor. He exudes his signature corruption and charisma and while he doesn't outshine Travolta or Washington, he makes a believable almost-Bloomberg (notable for his actual riding of the subway). Each successive remake has had to update the original story so we get WI-FI, financial-speak, and a transit control room that puts the flat-screens in War Games to shame. Scott wants to ratchet up the tension so when the money is being delivered, there is a high-speed chase style scene through New York with a few kinetic collisions and familiar landmarks. What does all this add up to? A competent thriller. The Taking of Pelham 123 doesn't have any of the highly questionable, stupid bits that the later Die Hard movies did -- well, sort of -- except for the first -- what company has their office Christmas party on Christmas Eve? The "brilliant plan" that the hostage takers employ is kept true to the original story with a bit of a modern-day economic melt-down flavor to it, but it doesn't exactly startle us. A section of the movie where Washington decides to take some matters into his own hands felt more like Hollywood than anything organic to the story; but we all know the movie cannot end with the two principals just separating and having a bunch of cops that we do not know swoop in and try to clean things up. Over all I think Pelham is a reasonable shot at a summer thriller -- it won't electrify you, but it isn't the third rail either.